Surya Namaskar is also called Sun Salutation, as in Sanskrit, the name ‘surya’ means the sun and ‘namaskar’ means ‘salutations’. In yoga, Surya Namaskar, the set of twelve Yoga Poses, is a complete sadhana as it is a spiritual practice in itself and includes asanas, pranayama, mantra and meditation technique. Yoga exercises of Surya Namaskar are good for weight loss and even help contain blood sugar levels. Its regular practice regulates Surya Nadi, whether it is underactive or overactive. This, in turn, leads to a balanced energy system at both mental and physical levels. Although there are 12 poses of Surya Namaskar, yoga positions 8 to 12 repeat the first five yoga asanas in reverse order. From the ancient times to the day today, the sun is worshipped by Hindus in different ways. In yoga, the sun is represented by the ‘pingala’ or Surya Nadi, which is the right nostril and carries the vital energy called ‘Prana’. The ideal time to practice Surya Namaskar yoga exercise is at sunrise. And the best results will be achieved when the practice is done facing the rising sun. However, the Surya Namaskar can be practiced at any time of the day provided the stomach is empty. Spread a Yoga Mat and stand straight with weight distributed equally on both the legs and feet slightly apart. 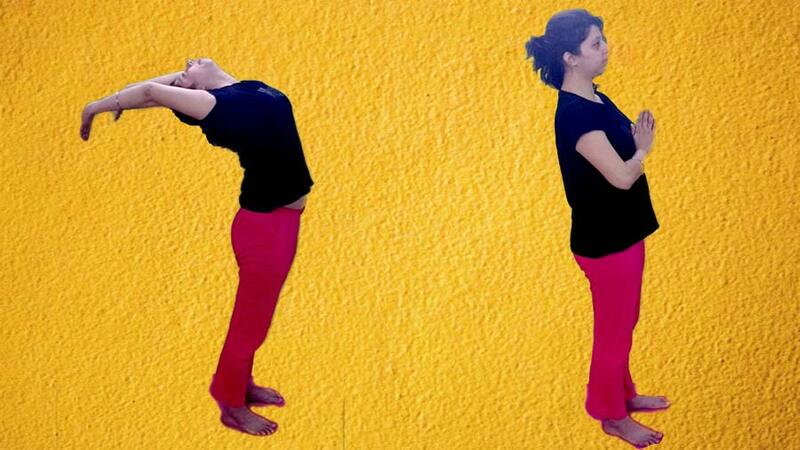 Bend the elbows and join the hands in front of the chest in Namaskar mudra. Surya Namaskar Mantra : Om Mitraya Namaha. While breathing in raise both the hands above the head and then further bending the arms, head and whole trunk backward providing a gentle stretch to the front part of the body. Both the arms should be shoulder width apart. Surya Namaskar Mantra : Om Ravaye Namaha. Let the forehead touch the knees. Knees should be kept straight. Do not strain at any point of time. Maintaining the hands’ position same as in Position 3, stretch the right leg back as far as is comfortable. Let the right knee touch the floor and also put the toes of the right foot on the floor. Breathe in while moving from position 3 to position 4. In the final position, the left foot and both the hands will be in a line, with the right shin perpendicular to the floor. Also, the weight of the body will come on both the hands, the left foot, right knee and the toes of the right foot in the final position. The head will be tilted slightly backward and back will form an arch. Keeping the hands and right foot still, stretch the left foot back beside the right foot. Raise the buttocks and lower the head between the arms so that a shape of a mountain is formed by the body. In the final position, the heels should touch the floor with legs and arms remaining straight. In the final position only the toes, knees, chest, hands and chin will touch the floor. the breath should be held out in this pose. The buttocks, hips, and abdomen should be raised in the final position. With the toes and hands on the floor as in position 6, slide the chest forward raising first the head, the shoulders, the chest, and the abdomen till the navel, and come in the cobra pose. Buttocks and hips are lowered to the floor with the arms supporting the trunk. Remember that hands and feet should not move from position 7. Keep the arms and legs straight and lower the heels touching them with the floor. Keep the position of palms and left leg should remain the same. While breathing in bend the right leg and bring the right foot forward between the hands. At the same time lower the left knee to touch the floor. Tilt the head backward and arch the back. Both the palms and right foot should be the same as in position 9. While breathing out bring the left foot forward next to the right foot. Straighten both the legs. Bring the forehead as close to the knees as possible without straining. While breathing in start raising the torso and stretch the arms above the head. Bend the arms, head and upper trunk backward. This complete one round of Surya Namaskar Yoga. Beginners should start with 2 to 3 rounds and slowly reach up to 3 to 12 rounds in total, depending upon the individual capacities. Lie down in Savasana and allow the breath and blood circulation to return to normal for further Yoga exercises. Surya Namaskara is known as the complete practice or total yoga workout. Its benefits include the revitalization of the whole body. Surya Namaskara poses exercises the entire body in twelve movements. 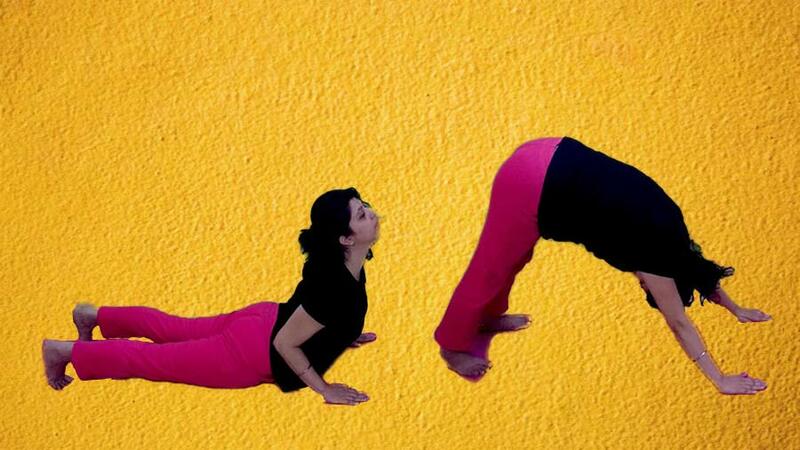 By means of the Surya Namaskar yoga steps, the abdominal organs and the stomach are stretched and compressed. Surya Namaskar Yoga, also called Sun Salutation yoga gives a wonderful massage to all the organs of the body and ensures that they will function correctly. If they are not working efficiently at present, it encourages them to do so. Alternate forward and backward bending in this dynamic group of asanas along with synchronized exhalation and inhalation respectively ensures that the practitioner breathes deeply and rhythmically encouraging the supply of fresh and oxygenated blood to the brain increasing mental clarity of the practitioner. Surya Namaskara stimulates the peristalsis of the intestines, which helps to remove constipation. It is good for females and removes all the menstrual disorders. Surya Namaskar sequence is best recommended for children from the age of 8 upwards. Surya Namaskar Yoga poses gently massages the kidneys and increases the blood flow to the whole body. It brings about perspiration, which cleanses all the pores of the skin and endows the practitioner with a clean, glowing complexion, a sign of perfect health. The practice of Surya Namaskar, the Sun Salutation, increases the heart action, but without excess strain, as is caused by hard physical or gymnastic exercises. Therefore, the blood flow is increased, and this helps to eliminate toxins from the body. In Surya Namaskar, the lungs are emptied of impurities and stale air, and the body is revitalized by the extra supply of oxygen that it receives. The whole body and brain function much better as a consequence. One can almost feel the extra supercharge of energy as a result of Sun Salutation Yoga poses. It harmonizes the whole endocrinal system of glands and helps to remove any irregularities by directly massaging and increasing the blood flow to them. In the yoga moves of Surya Namaskara, the spinal column is bent and stretched in a systematic manner to the maximum extent, thus stimulating the circulation of blood in the whole spinal cord and all the nerve plexus. As a consequence, it brings health and vitality to the entire nervous systems. Through this practice, all the main muscles and joints in the body are exercised, stretched and squeezed. This helps very much to return impure, stagnant blood to the lungs and kidneys for purification. The practice of Surya Namaskara can also give you many subtle benefits beyond the physical. It induces peace of mind, reduces emotional conflicts, neurosis and stress. It is an excellent Yoga Workout for the morning, as it will prepare you in all ways to face the oncoming day with physical and mental strength. There is no other exercise that can surpass it. By practicing Surya Namaskara for fifteen minutes daily, you will have sound physical and mental health throughout your life.